Ethel & Ernest started life as an award winning graphic novel from Raymond Briggs, creator of The Snowman. It is an affectionate recounting of the relationship between his mother and father over 40 years of marriage. Following the world premiere at the 60th BFI London Film Festival, the animated feature adaptation is due to arrive in UK cinemas this October. The film will feature the acclaimed actors Jim Broadbent and Brenda Blethyn in the title roles, and is directed by Roger Mainwood. The first trailer has arrived.. and we have to say this is looking pretty special. The distinctive pastel-coloured style of Briggs' original books, so familiar to those who grew up on The Snowman are recreated perfectly. The style of the film itself looks to be very gentle and heartwarming, although we suspect this is also going to pack quite the emotional punch. 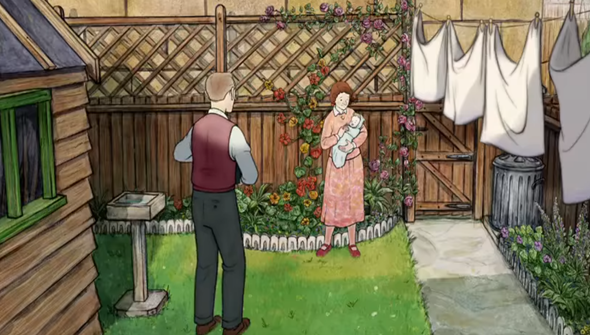 Ethel & Ernest will be released in UK Cinemas from October 28th 2016 via Vertigo Releasing. Check out the trailer below, and why not let us know what you think in the comments?